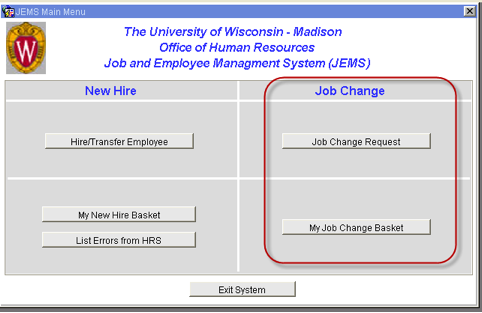 This document walks you through the process of making job changes in JEMS. 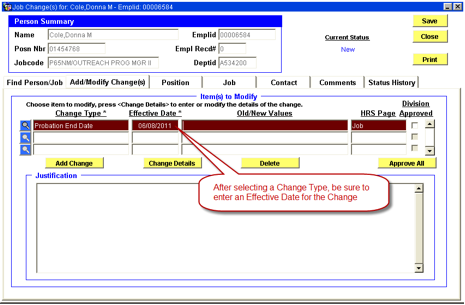 This document covers how to complete and review a Job Change Request in JEMS. 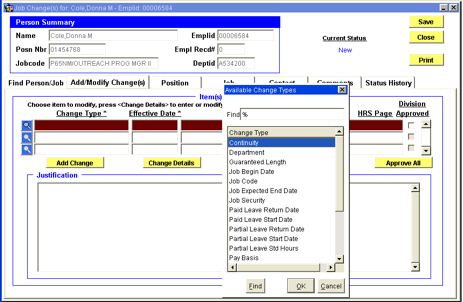 The JEMS Job Change Request feature is an optional tool that may be utilized by decentralized divisions. Please refer to your division to find out if your division will utilize this tool. If you click on Job Change Request button the below screen will appear. The first step is to populate the transaction with the existing employee you are submitting the JEMS Job Change request for. Use the steps below. 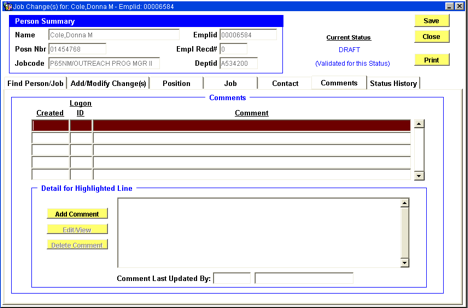 The next step is to enter in the job or position data change request. Use the steps below. 3 A pop-up window will appear. 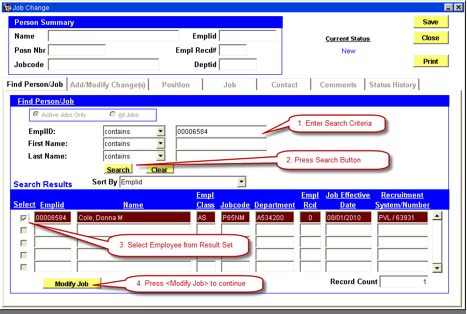 Select the appropriate change from the drop-down list (options should include job and position data changes). 4 Click the OK button to close the pop-up window. 5 Enter in the effective date of when you would like the change to go into effect. 6 Enter in the appropriate justification (explanation) for the change into the justification field. These justifications are created by staff that are authorized for the department or division (only users with the proper UDDS authorization are able to view the justification section). 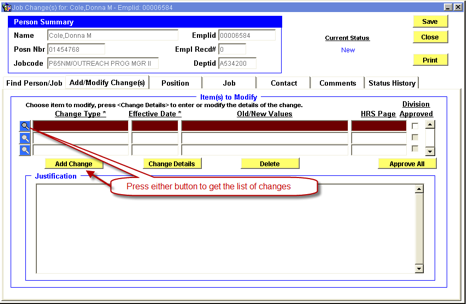 *The Add Change feature is used if you are adding more than one change a JEMS job change request. If multiple changes have been requested, change details will need to entered for each change type. Click on each line to highlight it before following the below steps. 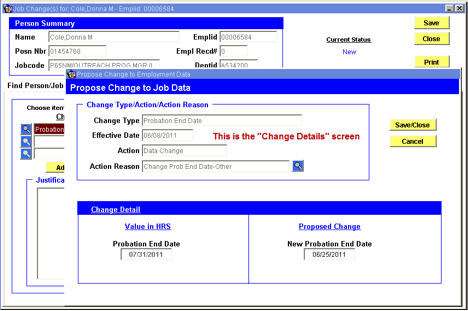 10 Click the Change Details button to bring up the "Propose Change to Job Data" screen. 11 On the Propose change to job data screen, click the magnifying glass button on the action reason link and select the appropriate reason (some changes will not have a reason available - leave these blank). 12 Complete the change detail section by clicking on the magnifying glass button and choosing the appropriate option. *The changes that are requested will automatically populate onto the Position and Job Tabs. These tabs are not modifiable, if a correction needs to be made before submitting the Job Change request, these changes must be made on the Add/Modify Change(s) tab. This tab stores information about one or more people who may be contacted about the appointment (multiple additional contacts can be added). 1 Click the add contact button to modify the detail for selected contact section. 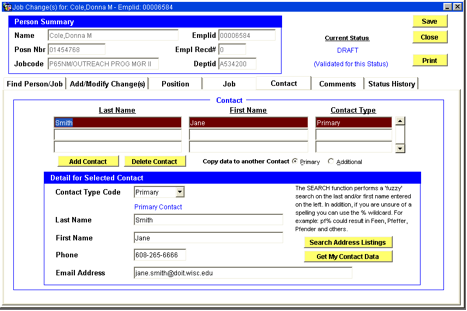 Select whether the contact is the primary or additional contact. Primary Contact- The primary person to be contacted regarding the appointment is required. Additional Contact- Name of an additional contact (optional). Examples of people you could add as additional contact include a funding or benefit contact (changes may affect funding or benefits). 2 Enter in the information for the contact and click the done button. Phone- Area code defaults to 608. Manually enter the phone number, including a dash between the third and the fourth number e.g. 263–2511. Email Address- email address of the primary contact is required. 3 Click the add contact button to add another contact. This tab is for comments associated with the individual change request. These comments are created by staff who are authorized for hire. Only users with the proper UDDS authorization are able to access this tab. Those who have access to the tab can view all comments. Also listed on this tab are reports from the HRS Processing Log. Existing comments are displayed in order by create date with the most recent comment on top. Update a Comment Place a cursor on the comment record you wish to change in the first half of the screen (the background color of the record will be dark red) and click the edit/view button. Delete a Comment Place a cursor on the comment record you wish to delete in the first half of the screen (the background color of the record will be dark red) and click the delete button. *Only the person who created the comment may update or delete that comment. The data on this tab is not modifiable. It displays the history of statuses that a particular change has had. Anyone with update or view access can view the status history of the appointment. The statuses are displayed with the most recent status on the top line by status effective date. Press the <Search> button to get the search result and select the employee. Check only one select box to choose the appointment to change. Click the <Modify Job> button. Click either the magnifying glass on the highlighted Change Type link or the <Add Change> button to get the drop-down list of change types. Select the appropriate changes from the drop down list. Enter the Effective Date in the Effective Date field. Click the <Add Change> button. If you are entering more than one change, repeat the process on the next line. The Justification field is for providing the appropriate justification/explanation for Change. These justifications are created by staff that are authorized for the department or division. Only users with the proper UDDS authorization are able to view the Justification section. Click <Change Details> button to bring up the “change details” screen. On the “change details” screen, press the magnifying glass button on the “action reason” line and select the appropriate reason. If there are two or more proposed changes, click the <Change Details> button and select the appropriate action reason for each Change Type. The next two screens show examples of different change types. (eg. The FTE change will be on the “Position” tab. A “Probation Change” will be displayed on the “Job ” tab. This tab stores information about one or more person whom may be contacted about the appointment. Press the <Add Contact> button to open up the entry fields in the bottom portion of the screen. For paid position, one Primary and one Funding contact are required. For zero dollar position funding contact is not required. You may have any number of Additional Contacts listed. Press the <Add Contact> button to add another contact. Funding Contact: The person who enters the funding information to be contacted when the appointment is successfully entered in HRS. Address is not a required field. Area code defaults to 608. Manually enter the phone number, including a dash between the third and the fourth number e.g. 263–2511. Email address of the Primary Contact is required. * To CREATE a Comment: Press the <Add Comment> button and type the comment into the detail box. * To UPDATE a Comment: Place the cursor on the Comment record you wish to change in the first half of the screen (the background color of the record will be dark red) and press the Edit/View button. * To DELETE a Comment: place the cursor on the Comment record you wish to change in the first half of the screen (the background color of the record will be dark red) and press the <Delete Comment> button. Only the person who created the comment may update or delete that comment. The data on this tab is not modifiable. It displays the history of statuses that a particular change has had. Anyone with update or view access can view the status history of the appointment. 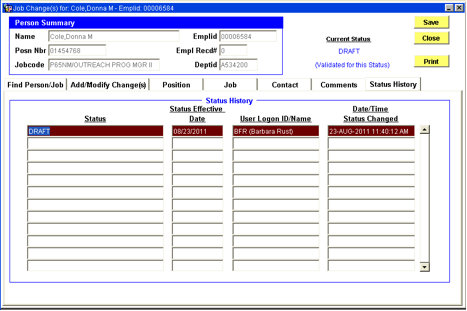 The statuses are displayed with the most recent status on the top line by status effective date (MM/DD/YYYY).